KISS front man Paul Stanley will present his artwork and make two appearances on January 4 and 5, 2008 at the Wentworth Galleries at Roosevelt Field Mall in Garden City, New York. The appearances are open to the public and free of charge. Call the gallery for details on the VIP Reception with Paul Stanley. 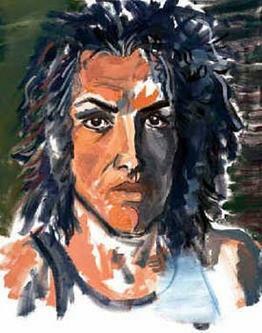 Also, check out a recent interview with Paul Stanley about his art on "Good Day Atlanta" at MyFoxAtlanta.com. He talks about how he began painting and what his art means to him. He talks about his first painting, which was a self portrait (shown here). It’s a pretty entertaining and funny interview where he also talks about his relationship with his KISS band mate Gene Simmons, and he ends the segment by doing the weather with a very excited weather woman. Visit the Pop Life Art homepage for links to the artwork of more than 100 singers, actors, and musicians.